In a temporary base, the Shredder orders Bebop and Rocksteady to use their initiative to defeat the Turtles and then leaves them to it. Brilliant. The two mutants spot a leftover can of mutagen and decide to dump it into the sewers and poison the Turtles. Brilliant. 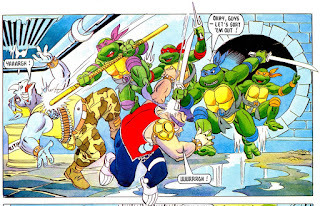 The Turtles spot Bebop and Rocksteady coming and successfully beat them up, driving them away. Little do they know, the mutants have left the open can of mutagen behind in the sewers. Out in space, a fleet of alien transport crafts are passing by the Earth. One of them loses control of their steering and bumps into the other. The ship containing eggs for a breeding program is pierced and one of the eggs is sucked out into space. It lands in New York (protected from impact by its hard carbonite shell) and rolls down the same storm drain that the Turtles fell through when they were babies. It plops into the open can of mutagen and begins to grow. Hearing the commotion, the Turtles investigate and find the egg hatching. From within emerges a giant baby dragon. It's sweet, but wild, and soon storms into the streets above. By coincidence, it finds the warehouse Shredder was using as a temporary base and destroys the Foot Clan's operations there. 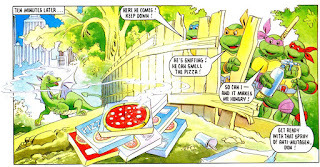 Looking over the base, Donatello finds a can of anti-mutagen and hatches a scheme. Luring the baby dragon with some pizza, Donatello sprays it with the anti-mutagen, reverting it back to the tiny baby dragon it was supposed to be. A ray then blasts down from the sky and beams the dragon back onto the transport ship. The Turtles figure its for the best, as New York just isn't ready for dragons yet. In fact, they're barely ready for turtles! *This issue is continued from TMHT Poster Mag #3. This is the last issue of the series. 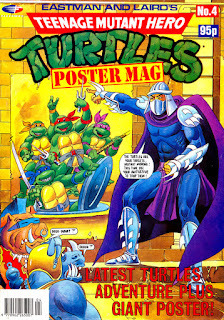 *The poster in this issue was of Splinter. I've come to the conclusion that kids bought these poster mags more so for the posters than the mags. These comics haven't exactly been Fleetway's best output, if you can quantify a "best output" for the publisher, and seem more like a skimpy bonus to go along with the poster you taped to your wall. Of the poster mag comics, I think I liked this one the most. The story is hectic and full of conveniences, but the bright artwork has a cartooniness that the darker, over-inked art from other issues lacked. The characters also seem to be drawn more congruous with their actual animation models, whereas the other Fleetway artists were still using Michael Dooney's models from the original Archie miniseries as their point of reference. One of the weirdest things about this issue is that the narration makes a point to illustrate that the sewer grate the dragon egg falls through is the same grate the Turtles fell through as babies. It seemed like some sort of laborious poetic symmetry that was way out of line for a comic like this, but it actually kinda sorta makes sense if you think about it way too hard. So in the Fred Wolf/Archie/Playmates origin, the grate the Turtles fell through led to where Hamato Yoshi was living at the time. The Shredder, in an attempt to kill Yoshi, poured mutagen through that same grate, covering the baby turtles. 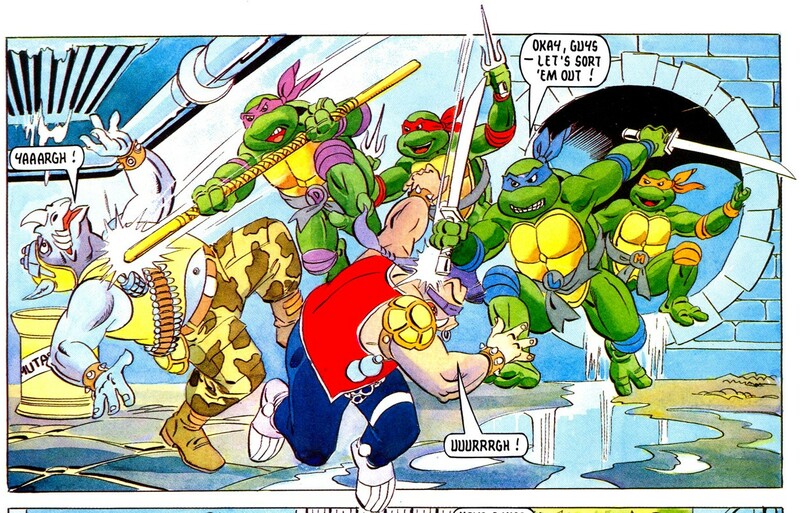 Bebop and Rocksteady essentially try to copy Shredder's original failed scheme, but not knowing where the secret sewer lair is (discounting all those times in the Fleetway comic where they do know), they attempt to dump the mutagen down the one place where they know it had hit the Turtles in the past: That particular sewer grate. 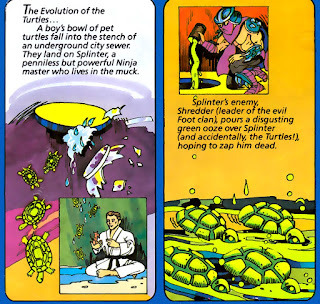 None of this really makes sense if you spend an extra second on it, as Shredder dumping mutagen in the sewer to kill Hamato Yoshi was always one of those weird parts of the Fred Wolf origin that barely held together (How did he know Yoshi was down there? Why didn't he just attack him in person? Why did he pour mutagen of all things on him instead of, I dunno, napalm?). Still, it's the only reason I can think for the writer to have put that bit of happenstance in the script. The Fleetway Turtles can be real dicks. "None of this really makes sense if you spend an extra second on it, as Shredder dumping mutagen in the sewer to kill Hamato Yoshi was always one of those weird parts of the Fred Wolf origin that barely held together (How did he know Yoshi was down there? Why didn't he just attack him in person? Why did he pour mutagen of all things on him instead of, I dunno, napalm?). Still, it's the only reason I can think for the writer to have put that bit of happenstance in the script." I personally go and back on that particular subject a lot, but I'm ultimately willing to get past those serious logic issues as I don't mind the "it sets up the Shredder as actively responsible for the Turtles' creation vs. most other media where he's more of an indirect influence" premise. Also, given how most of the Yoshi/Saki backstory had to be censored or downplayed or glossed over for 80's animation censors, David Wise probably did the best he could think of, at the time, called it a day. While I'm at it about the Fred Wolf Yoshi/Saki backstory, I often think about how the series could have handled Tang Shen, but that's for future commentaries. Lastly, "why mutagen instead of napalm," my current headcanon about that goes, "he could have originally thought the mutagen was poison, since it was said to be experimental, maybe didn't know what it could really do at the time, as Krang outright confirmed he intended to use it to 'destroy Yoshi.'" Probably thought it would be a good slow agonizing kill. I try to support that theory with his use of the Doku plant against April in Enter: The Fly." Only this time, it really was poison. Okay, back to the MST3K mantra, "it's only a TV show..."
As for the actual issue, it seems more of "like the concept, not the execution" as Bebop and Rocksteady showing "initiative" could have been potential comedic gold. Instead, what we got a near-rehash of Baby-san's rampage from the first Usagi episode (or it felt that way to me in reading the synopsis). Nevertheless, I did appreciate the effort of intentionally replicating the Turtles' origin, or what Mark called "laborious poetic symmetry." When comparing to the other three Poster Mag stories, it's actually a little more ambitious. Vs. fighting in gliders, a costume party fight, a foiled bank heist, etc. I commend you for putting fare more thought into this plot than I would have. Your observations about the significance of the Turtles' origin story was surprisingly insightful as to the weird logical consistency of this story. Initially, the choice of the sewer grate just struck me as an odd coincidence. Killer Moth offered some good thoughts too in regards to April's Doku plant in "Enter the Fly" and the parallel's to the old Usagi Yojimbo episodes. "Out in space, a fleet of alien transport crafts are passing by the Earth. One of them loses control of their steering and bumps into the other. The ship containing eggs for a breeding program is pierced and one of the eggs is sucked out into space. It lands in New York (protected from impact by its hard carbonite shell) and rolls down the same storm drain that the Turtles fell through when they were babies. It plops into the open can of mutagen and begins to grow." "Killer Moth offered some good thoughts too in regards to April's Doku plant in "Enter the Fly" and the parallel's to the old Usagi Yojimbo episodes." In hindsight, I probably should have added a line on Usagi's second episode, as it actually did show Bebop and Rocksteady using initiative to hilarious results, via their fuel-stealing. Whoops. Forgot about that, but I now feel better about the Baby-san parallel. The Doku plant analogy was something I've thought about for years, so glad I could finally show it off, here. Might be wrong about this, as I wasn't sure enough to add it originally, but the mutagen/poison logic also could have been a by-product of Fred Wolf Season 1 Shredder's characterization. In that, he was a tad more deliberate in his evil vs. the Leeroy Jenkins behavior he'd later have. Back then, could have been more patient with Yoshi dying a slow death vs. later. Not to say the Leeroy Jenkins behavior wasn't there from the start, either, as Mikey goaded him like a master at the end of "A Thing About Rats." Also, that old Playmates action figure art Mark put up, man, that gave me a well-needed case of nostalgic feels. For that, I'm forever grateful. As much as I love it too, that action figure card back art is pretty inaccurate with the universe's origin story. In the first panel we see the baby pet turtles falling through an open manhole instead of a sewer grate, like it was usually displayed. Likewise, Shredder's seen pouring a what seems a Starbucks cup (not a canister) of mutagen through (probably?) the same manhole. That's a huge safety issue right there. If I were hiding in the NYC sewers, I wouldn't be doing it in the one place where the manhole cover is missing all the time and where people kept dumping stuff on my head. 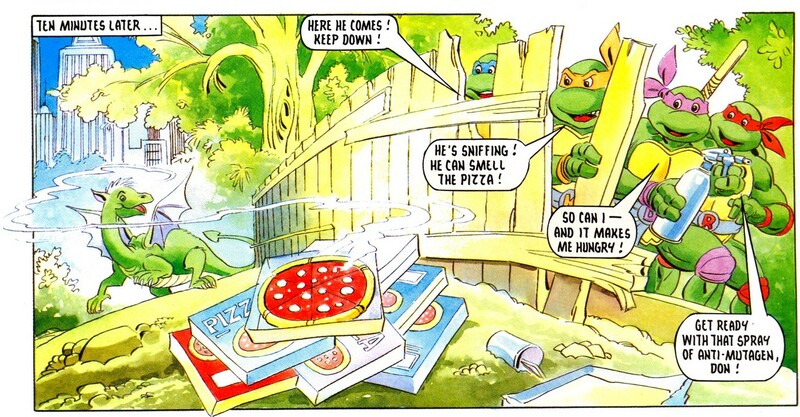 What kind of lazy ninja is Hamato Yoshi, sitting in a huge pool of sewer water? That's one gross sensei. On Hamato Yoshi... He looks suspiciously Caucasian in this image. Interestingly, the accompanying text also refers to him as Splinter, even before he was mutated. I'm not calling Playmates Toys out on white-washing, but the Japanese background of the origin story is completely glossed over. And why is he wearing a judo outfit? Whoever drew and painted this likely only had the pics of the action figures as a point of reference. I guess we can forgive the artist for that though, as we're now old enough to understand the cartoon show was still in production at the time the packages were designed, and the toys looked nothing like the animated show anyway. Despite those flaws, it's still lovely, if only for the nostalgic sentiment of it.